How to test my underfloor heating? When can I turn my underfloor heating on? Can Warmup electric heating be installed in a shower? Can I cut my floor heating mat if it’s too large? How to install a floor heating mat around a drain in a shower. What if I damage the StickyMat Heater during / after installation? Why does my thermostat trip when I switch on my Underfloor heating ? Can more than one StickyMat Heater be controlled by the same thermostat? Can I connect one Warmup heater to another in series? Can I use the StickyMat System with floor coverings other than tiles? 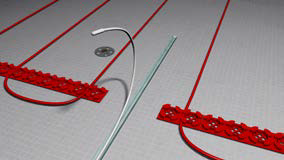 Do I choose cable or mat electric floor heating systems? The floor sensor should be placed centre of two wire runs at least 300mm into the heated area. It is important that the floor sensor is fitted in the correct location in order to read an accurate floor temperature. The floor senor must not be placed to close to the heating element or cross over any of the heating elements. It may be necessary to channel out a groove into the subfloor in order for the sensor to sit at the same height as the heating element. Secure the sensor to the floor using tape but do not tape over the sensor probe tip as this will result in inaccurate temperatures.